Klein Sun Gallery is pleased to announce Self-Created Universe, a two person exhibition featuring Ye Funa and Liang Ban, on view from January 12 through February 25, 2017. 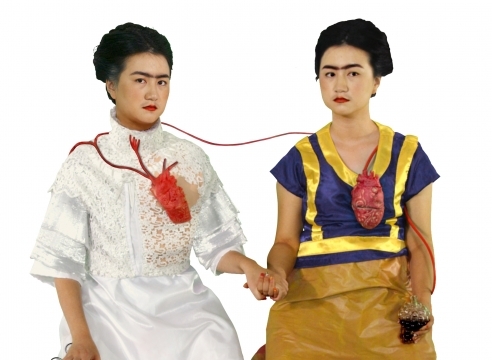 Curated by Beili Wang, the exhibition showcases a body of comical and unique multimedia works by the two artists. 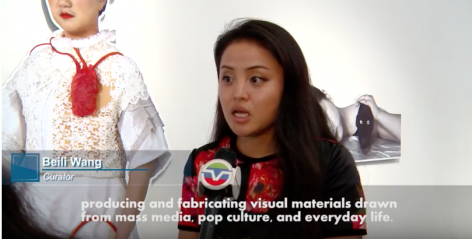 Collectively, they speak to our increasingly image-saturated world through producing and fabricating visual materials drawn from mass media, pop culture, and everyday life. Reflecting upon the theme of “self-creating,” Ye Funa presents the “Goddess” series in which she masquerades as thirteen female figures who were prominent or controversial in history, fashion, literature, and art. In the artist’s three-channel video, Legend of the Wellknowns (2015), one of the characters she personifies is Leonardo Da Vinci’s Mona Lisa. The mysteriously smiled sitter reveals herself as in fact a “selfie goddess” through Ye’s reenacting, as she pouts her lips and gives a victory gesture. Adhering to her parodic manner in another video Mona Lisa (2015), Ye Funa replaces the exquisite composition of Mona Lisa and the landscape with a blinking woman sitting in front of a traditional Chinese landscape painting. Infused with the absurd, bantering, and vulgar, Ye’s “Goddess” series examines the construction of identity and the artifice of image, it also elaborates on the recurring theme of the role of female, the idea of beauty, and the female sensibility in Ye’s recent works. Liang Ban explores the theme of self-creating in a different realm. Often constructing a fictional narrative, Liang interweaves the real and the invented seamlessly through digital devices such as smartphones. Two videos--Short Trip to the Moon (2015) and Holy Friday (2016) --shown in the exhibition illustrate how the artist recounts real-life moments swiftly and humorously. In Short Trip to the Moon, a man played by the artist is stricken by lightning at the moment in which he is taking a picture with his selfie stick. 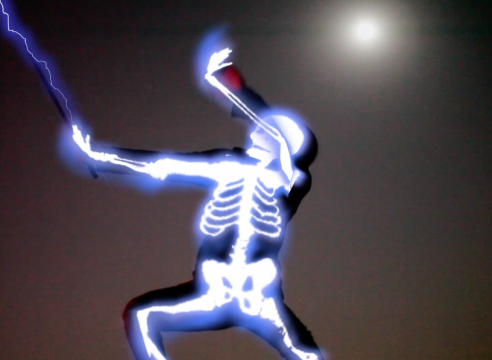 The electrical power immediately runs through the man’s body, radiating his skeleton in an X-ray effect. 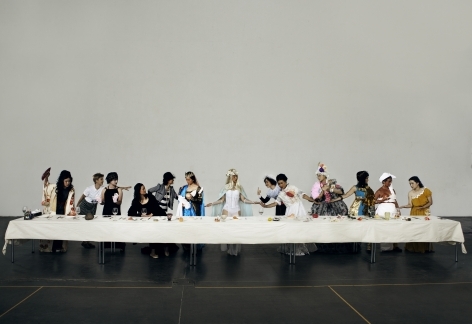 Liang Ban’s works reveal his interest in alternating between reality and fantasy through his use of technical wizardry. Ye Funa was born in Kunming in 1986. She graduated with a Bachelor’s degree in Experimental Art from the Central Academy of Fine Arts, Beijing, China in 2008 and a Master’s degree in Fine Arts from the Central Saint Martins College of Art, London, UK. Her recent solo exhibitions include, Curated Nail Residency, MoCA Pavilion, Museum of Contemporary Art, Shanghai, China (2015); People's Congress via their Nails-Exhibitionist’s Curated Nails, Art Museum of Nanjing University of the Arts, China; and Zha Golden Flowers--News from Nowhere, V Art Center, Shanghai, China (2014). Her group shows include Folklore of the Cyber World-CAC@the Chinese Pavilion, Periphery Event of la Biennale di Venezia, Venice, Italy (2015); The Civil Power, Beijing Minsheng Art Museum, China (2015); Tomorrow’s Party, Ullens Center for Contemporary Art, Beijing, China (2014); Contemporary Photography in China 2009 - 2014, Minsheng Art Museum, Shanghai, China (2015); Busan Biennale, Kiswire Sooyoung Factory, South Korea (2014); Ten Year in One Inspection, CAFA Art Museum, Beijing, China (2014); Poker Face: Wu Junyong / Ye Funa, Ray Art Center, Shanghai, China (2014); Contact: Through the Body, University of Toronto Art Centre, Canada (2014); The First ‘CAFAM - Future’ Exhibition, CAFA Art Museum, Beijing, China (2012); Asian Art Triennial Manchester, Piccadilly Place, U.K. (2011); Future Pass--Collateral Event of the 54th Venice Biennale, Fondazione Claudio Buziol, Italy (2011). Ye Funa was selected for the residency program Kunst Gemeinsam Gestalten !, Gesellschaft für Deutsch-Chinesischen Kulturellen Austausch e.V., Berlin, Germany (2016), she also received 2nd Hua Yu Youth Award: The Judges’ Choice Award (2014), and Recommend Young Artist of Today Art Museum (2015). Born in Guangxi, China in 1985, Liang Ban graduated with a Bachelor’s degree in Fine Art from Guangxi Art Institute, Nanning, China in 2010. He currently lives and works in Beijing. 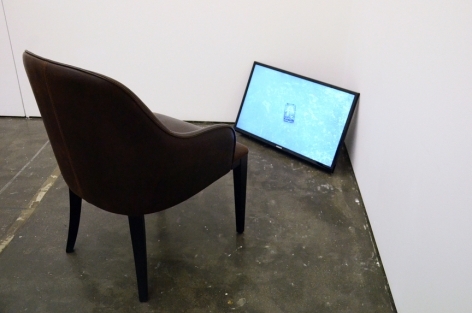 Liang’s recent solo exhibitions include, Landscape Browser, de Sarthe Gallery, Beijing, China (2016); and Slightly Confused, Taikang Space, Beijing, China (2016). His group shows include, The Image Expression in the Art Practice of the New Generation, Xi’an Museum, China (2016); GOOOOOOOOOOOOOOOAL, Goethe Institut, Beijing, China(2016); Turning Point: Contemporary Art in China Since 2000, Minsheng Art Museum, Shanghai, China (2016); In the Dimensionality, Between Art Lab, Shanghai, China (2016); Figure-Image-Drawing and Subject, Tsinghua University Art Museum, Beijing, China (2015); Olhares Interiores, Macao Museum of Art, China (2015); Polyphony II - Ecological Survey of Chinese Art - Beijing, Art Museum of Nanjing University of Arts, China (2014); A Room Not One’s Own, Space Station, Beijing, China (2014); Self Identity Out of the Land of Experience, Hong Kong Contemporary Art Gallery, Beijing, China (2014); Art Sanya, HIHEY Art Center, China (2013); The Speech: The Free Speech from the Artists, CAFA Art Museum, Beijing, China (2012); and FINAF International Artist Residency Program, Busan Art Museum, South Korea (2012). Liang Ban received Jimei x Arles Discovery Award (2016), and Art Sanya Hua Yu Youth Discovery Award (2016). Louis Soulard of Art Asia Pacific reviews Ye Funa and Liang Ban's group exhibition "Self-Created Universe." Blouin Art info features "Self-Created Universe." Art and technology platform The Creators Project reviews group show "Self-Created Universe," featuring Liang Ban and Ye Funa. The exhibition is on view through February 25, 2017. Wall Street International links "Self-Created Universe" in their Arts section.